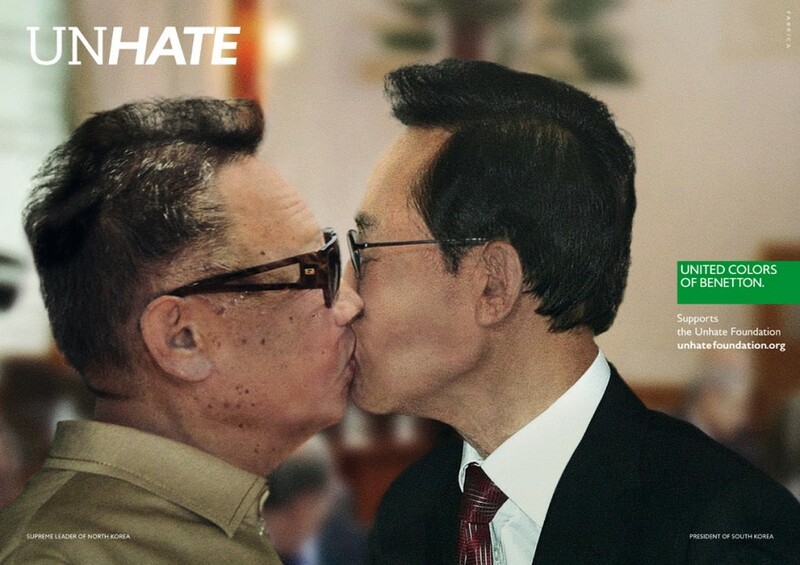 Benetton has launched The UNHATE project, an integrated advertising campaign featuring print, outdoor, digital and film focusing on the kiss, the most universal symbol of love. At the heart of the campaign is a set of retouched photos featuring kisses between world political and religious leaders, such as USA president Barack Obama and Chinese leader Hu Jintao, Palestinian president Mahmoud Abbas and Israeli prime minister Benjamin Netanyahu. Symbolic images of reconciliation, with a touch of ironic hope and constructive provocation, are designed to stimulate reflection on how politics, faith and ideas, even when they are divergent and mutually opposed, must still lead to dialogue and mediation. 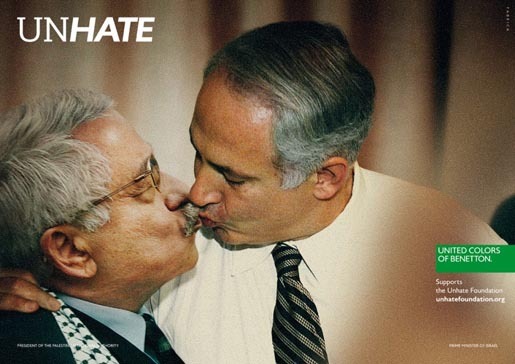 Palestinian President Mahmoud Abbas kisses Israeli Prime Minister Benjamin Netanyahu. 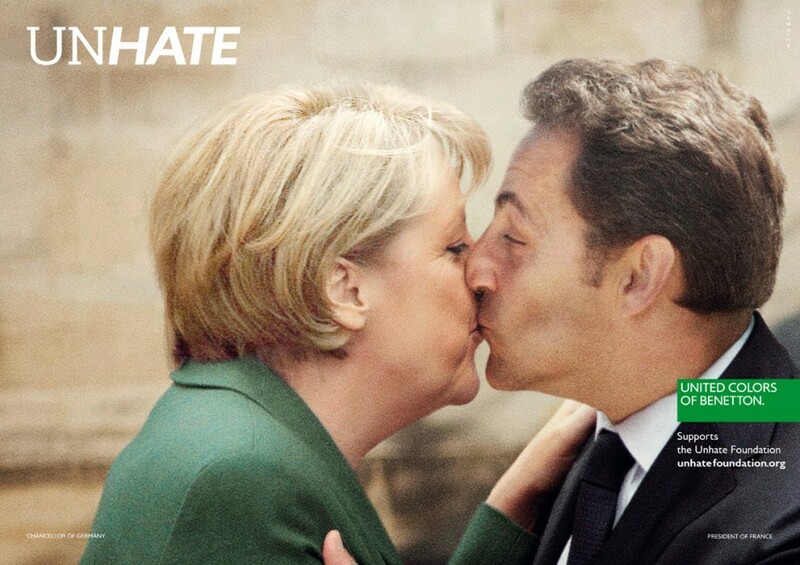 Unhate Chancellor of Germany Angela Merkel kisses President of France Nicolas Sarkozy. Supreme Leader of North Korea Kim Jong-il kisses President of South Korea Lee Myung-bak. President of the USA Barack Obama kisses President of Venezuela Hugo Chávez. Since the campaign’s release Benetton has withdrawn the photo of Pope Benedict XVI and Ahmed Mohamed el-Tayeb, Imam of the Al-Azhar mosque in Cairo (the most important and moderate centre for Sunni Islamic studies in the world), after complaints from the Vatican. 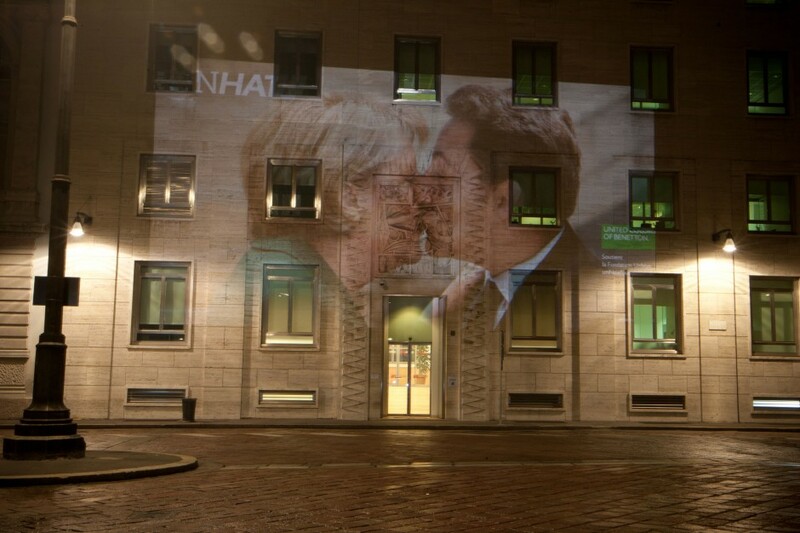 There Benetton “Kiss Wall” invites people to upload pictures of themselves kissing and a short film about spreading love, not hate. The site also includes a screensaver for PC and Mac platforms, along with the Unhate soundtrack. The Unhate List brings together Twitter posts on Unhate, making the case for unhating our enemies. What does UNHATE mean? UN-hate. Stop hating, if you were hating. Unhate is a message that invites us to consider that hate and love are not as far away from each other as we think. Actually, the two opposing sentiments are often in a delicate and unstable balance. Our campaign promotes a shift in the balance: don’t hate, Unhate. Hatred is never appeased by hatred in this world. By non-hatred alone is hatred appeased. This profound and humane concept of tolerance sums up the principles inspiring the UNHATE CAMPAIGN, which Benetton has created with the aim of contrasting the culture of hatred and promoting closeness between peoples, faiths, cultures, and the peaceful understanding of each other’s motivations, using a global call to action and the latest communication tools. “While global love is still a utopia, albeit a worthy one, the invitation ‘not to hate’, to combat the ‘culture of hatred’, is an ambitious but realistic objective,” explains Alessandro Benetton. “At this moment in history, so full of major upheavals and equally large hopes, we have decided, through this campaign, to give widespread visibility to an ideal notion of tolerance and invite the citizens of every country to reflect on how hatred arises particularly from fear of ‘the other’ and of what is unfamiliar to us. Ours is a universal campaign, using instruments such as the internet, the world of social media, and artistic imagination, and it is unique, in that it calls the citizens of the world to action. At the same time, it fits perfectly with the values and history of Benetton, which chooses social issues and actively promotes humanitarian causes that could not otherwise have been communicated on a global scale, and in doing so has given a sense and a value to its brand, building a lasting dialogue with the people of the world. The new campaign, the creation of the Foundation and the other initiatives of the UNHATE project reflect Benetton’s wish to drive the desire for participation and change that animates the world’s citizens, and especially the young, inviting them to play an active, central role in its initiatives, particularly through the internet, social media and other digital applications. This marks a further step forward in Benetton’s communications, which elicit intervention and action from everybody, in the name of an “expanded”, open democracy, without physical, political, social or ideological boundaries. The Unhate campaign was developed at Fabrica, Treviso, Italy, by creative director Eric Ravelo, creative director/designer Paulo Martins, design director/partner Robert Nakata, brand directors Judson Whigham and and Frederic Point, print producer Maria Perez, and at 72andSunny, Los Angeles, by creative director Carlo Cavallone, designer Wendy Richardson and agency producer Sam Baerwald. Retouching was done at Loupe Digital Imaging, London and Amsterdam, by Gareth Jones and Guillaume Koening. Filming was shot by director Laurent Chanez via Identity with producer Ellen Pot, executive producer Joe Masi, line producer Claire Barnier, director of photography Arnaud Potier. Post production was done at Mikros Image by editor Mario Battistel, executive producer Fabrice Damolini, producer Elise Dutatre, producer Sandrine de Monte, colorist Sebastien Mingam. Music and audio mix were produced Kouz Production by executive producers Gregoire Couzinier, Thomas Couzinier, composer/arranger Frederic Kooshmanian, sound engineer Bruno Porret, musicians Anne Gravoin, David Braccini, Emmanuel Blanc, and Ericmaria Couturier.